. 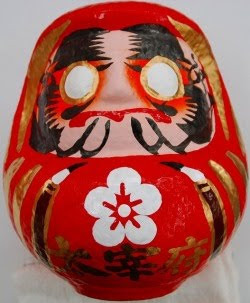 "Regent Daruma" リーゼントだるま . Let us venture into the world of incense. Sometimes I feel the private use of incense in a home is the origin of all modern aromatherapy. To light an incense stick and a candle after a hectic day of work, listen to some soft music and taste some nice ricewine is a treat for all of your senses. It lifts your spirit on a higer level in no time and lets you enjoy the moment as a human BE-ING, not DO-ING for a while. the true, good and beautiful (shinzenbi 真善美). During the Heian period the use of incense turned into an elaborate "Fragrance Hobby" (gankoo 翫香) which brings us to the novel of Genji (Genji Monogatari 源氏物語) by Murasaki Shikibu 紫式部. In "The Book of Incense"
Kiyoko Morita introduces you to this "refined, highly nuanced art form intimately related to classical Japanese poetry and prose and dedicated to an enhanced appreciation of the sences." If you are ready for a new experience of the senses, follow the many hints of this lovely little book. In the foreword by Professor Edwin Cranston from Harvard University we read: "As in all matters of cultural appreciation, one needs to enter into the spirit of the thing. The fragrance of smoldering aromatic woods, each subtly different, makes it easy to do just that. Fragrances remind us of home - the garden, the embrace of scented sleeves, the memory of one who has passed away - and in this resides their true power." 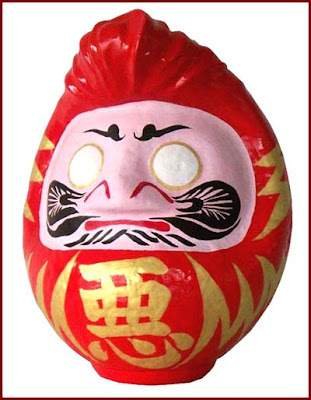 Maybe you want to light an incense stick before reading on, just as I always light one before sitting down at the desk pondering my Daruma stories. 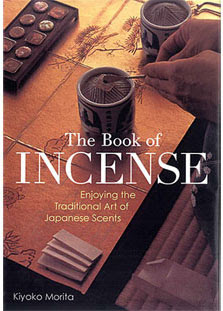 The smell of incense can be very subtle and faint, so the act of concentrated smelling it is called "listening to incense" (monkoo, bunkoo 聞香) in Japanese. Here is one explanation for this expression. In the Buddha's world everything is fragrant like incense, including the words of Buddha. Fragrance and incense are synonymous, and Buddha's words of teaching are incense. Therefore Bodhisattvas listen to Buddha's words in the form of incense, instead of smelling them. Here is a quote form David Ollers HP about the practical use of incense sticks during Zazen practise. "Commonly, most Buddhist teachers will say incense is not used as a psychotropic aid for meditation or religious practice, or a psychological-state altering vehicle to enlightenment. The vast majority of Buddhist monks would not prescribe incense for this purpose, and feel you should be able to meditate and achieve spiritual awakening regardless of the aromatic environment. Benefits the Zen monks may speak of are: incense helps keep the flies out of the Zendo, it prevents unwanted body odors from becoming a distraction, and that it is used as a clock or timer for sitting periods. And then they will tell you not to blink if a fly drinks the water from your eye, no odor should distract your meditation, and don't watch the clock since "Time is Being!" In an article by David Oller about incense making you find an introduction to many ingredients. 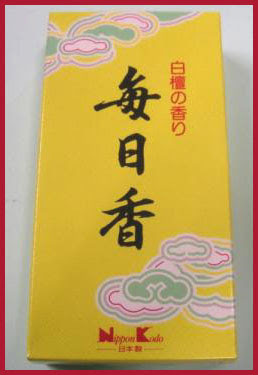 Nippon Koodoo (Nippon Kodo) 日本香道 also features some interesting information. Kyara is one of the most desired incense ingredients in the entire world! This amazing substance has affected individuals throughout history so powerfully that in many Asian languages the term "Kyara" has been used to signify the finest of things. The most beautiful women in Japan are called Kyara Ladies, meaning that their beauty is rare and the finest possible, Kyara Clogs meant high-quality clogs and so on. The most famous piece of Kyara is called "Ranjatai" and kept in the imperial storehouse Shoosooin (Shosoin 正倉院) on the grounds of the temple Toodai-ji in Nara. The white bands show where chips have been cut off as presents to high-ranking people like Oda Nobunaga, Toyotomi Hideyoshi and the first Tokugawa Shoogun Ieyasu. The other areas are Rakoku (羅国)、Manaka (真那賀), Manaban (真那蛮), Sumotara (寸門多羅) and Sasora (佐曽羅). You get the best fragrance from a lit stick if you keep it 20 to 30 cm from your nose. The red spot where the stick is burning does not emit fragrance, rather it is the part of the stick a few milimeters below where the heat causes the fragrance to be released. My favorite incense stick comes from the store Tenkun-Doo in Kamakura. It is the first on the list called 寿王. In Japan we have some other interesting types of incense. I will introduce you to two of them. The Heart Sutra (Hanya Shinkyoo) or other sutras are written in tiny golden or silver Chinese characters on 20 incense sticks. The name of the temple where you get them is usually also written on them. The stick does not disintegrate during burning but keeps standing with the tiny letters of the sutra shining dark on the ashes. It is quite a treat to sit down quietly and watch one stick slowly turning into living ashes. If you look at the HP quoted below and touch the box of incense, you can see a picture of the stick after burning. These wonders of handycraft are made by Anshin-Doo 安心堂. These sticks are almost five milimeters in diameter and you need a big container to stand them firmly. They are completely black with a light spot on the top side. You put them in the container with the spot facing you and sit back in quiet meditation for about 30 minutes. After the stick has burned down about 5 milimeters without disintegrating, the face of Amida Buddha is starting to appear on the white ash stick. 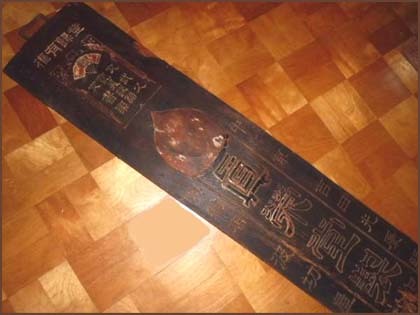 Then as it burns down further the Chinese characters for the incantation of Amida, Namu Amida Butsu, start to appear in dark color on the stick. As the gentle smell fills the room you can visualize the benevolence of the Buddha as you watch its name appear fully. One stick which I burned about a month ago is still standing firmly. 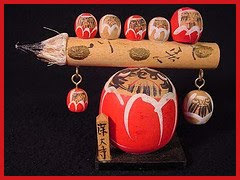 Its time to look at some incense stick holders with Daruma. Here is one made of Bizen pottery and sold at local stores in Bizen City. He is only 2 cm high but his eyebrows are strongly modelled and he seems to watch the incense stick while it burns. 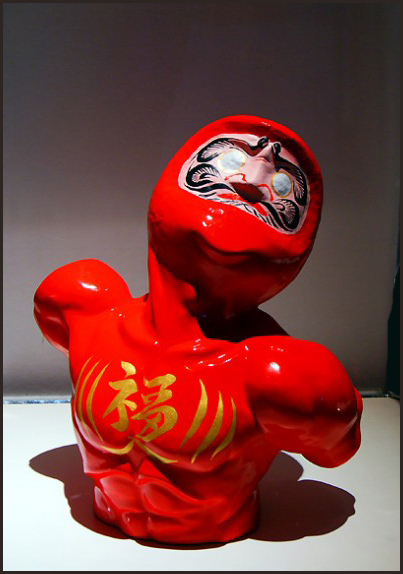 This little fellow is made of Arita pottery. He comes with a little tray of white and red color. His face is painted in blue and he holds his arms forward to take the incense stick almost as if it was a sword to fight. He is 3.5 cm high. This one comes with a heavy white tray and is quite heavy himself. His face is simple but quite expressive. 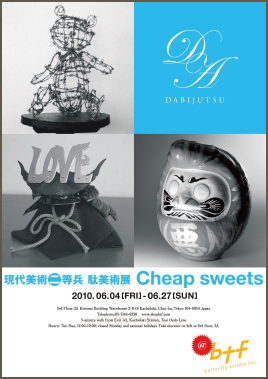 He is 3 cm high and made by Nippon Craft. still clings to your hair. 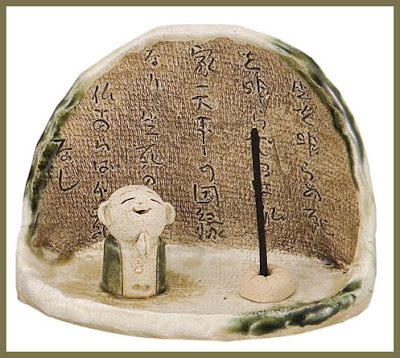 This is a talisman doll for people to start making a career as calligraphers. 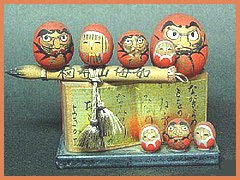 Daruma Fude だるま筆　pen called "Daruma"
The pens with a big belly for fat letters are DARUMA. Kumano cho is the capital of brushes, and produces 80% of the brushes made in Japan for painting, writing and cosmetics. However, none of the materials used to make the brushes come from Kumano. In other words, natural hairs of sheep, horse, itachi wolf, or raccoon are all imported from North America and China. Materials for brush handles are either from Okayama and Shimane prefectures, or imported from Taiwan and Korea. Kumano has an interesting history for this successful industry. A long time ago, the farmers used to buy brushes and ink from Nara and sell them to the locals in order to earn extra income after harvesting rice. 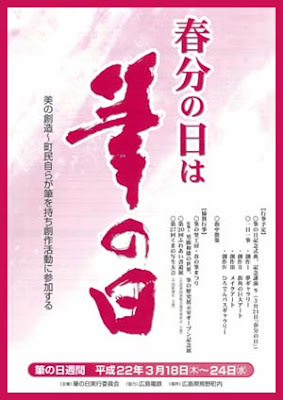 The Hiroshima local government encouraged this activity and Kumano began making brushes eventually as well. Later, Japanese calligraphy was introduced as a school subject, and the increased demand for brushes brought stability to the industry in Kumano. It normally takes 70 steps to create one brush. It is a manual process. It is said to take at least 10 years to be able to handle animal hairs properly and proficiently. The price of brushes varies: for example, one for a calligraphy class goes for about 1000 yen ($10). On the other hand, one used by a professional makeup artist or calligraphy artist will cost anywhere between several tens of thousands and 300,000 yen ($3-400 to $3,000). When Japan’s women soccer champions for the World Cup in Germany received the People’s Honor Award from the Japanese government, a Kumano make-up brush was presented to each player as a special gift. The tips of the hand-made brushes are naturally uneven, which produces a nice and delicate contact with paper or one’s face, helping to create a superb finish. Therefore, Kumano brushes are very popular among many world-renowned make-up artists. Fude Kuyo　筆供養 "memorial service for brushes"
Kumano is the greatest producer of brushes in Japan, more than 80% are made here. On the yearly event more than 1000 used brushes from professional writers are burned in a memorial sercice at the shrine Kitano Tenjin sha. There is a stone arrangement with the "brush burning flame of eternity" and a lot of brushes hang in the compound between the trees. 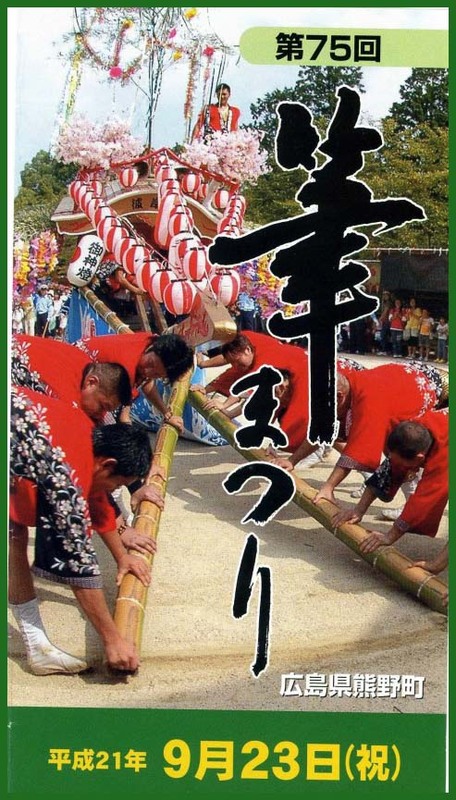 During the festival people use large brushes to write their favorite calligraphy and demonstrations are held. This kind of service is also held at other temples and Tenmangu shrines of Japan. Arima is one of the oldest hot springs in Japan, even Hideyoshi used to come there. The dolls also have a long history and are mentioned already in a travel book of 1682. There used to be five families producing them till the Taisho period, but now only one has remained. 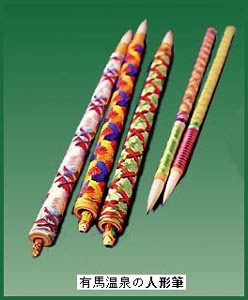 The body of the pen is decorated with colorful silk thread in various patterns. Some of the patterns have auspicious meanings to ward off evil. Some patterns are suited as a present, for example for a wedding. 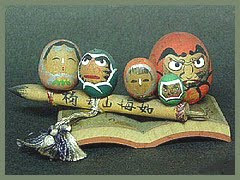 On the end of the bamboo shaft it a little doll, sometimes resembling a Daruma san, which pops out and seems to dance when using the pen for writing. When the pen is laid on the table, the doll disappears. This is a kind of "mechanical doll" (karakuri ningyoo).
. Folk Toys from Hyogo . The Hankeidou workshop is renowned for manufacturing traditional Japanese brushes, known generally as unpei fude (雲平筆), a tradition started by Fujino Unpei (藤野雲平) some 400 years ago during the Genna Era (元和年間, 1615 – 1624). shishun 試春（ししゅん）"first calligraphy in spring"
Written at a haikai meeting at Nagoya 名古屋昌圭亭. Some sources link this to the pure water of a spring in Yoshino. this pure water . . .
Basho stepping out into the garden after a very cold winter night, trying to pick up some dew from the leaves and write a hokku with it.
. ite tokete fude ni kumihosu shimizu kana .
. Basho and Saigyo 芭蕉と西行法師　. which Buddha will it be ? . From professional painters to official letter writers to bookkeepers to children at Terakoya schools . . . everyone needed a pen to write in the Edo period. When a pen was made, the brush maker licked it in a final test of its finishing. 1- Hair for calligraphy brushes is chosen based on the intended brush type and the length of the brush tip. The craftsman relies on instincts developed over many years of brush making. 2- Removing defective strands of hair is part of the tip-formation process. The tip represents the most important part of a calligraphy brush. A metal comb is used to comb through the strands of hair and align them accordingly, and strands without proper tips as well as those that are incorrectly oriented are removed from the clump. 3- The tip is formed by arranging strands into clumps for the very end of the tip (inochige 命毛), the middle portion of the tip (nodoge 喉毛) and the base portion of the tip (koshige 腰毛). One brush's worth of hairs is then taken from each of these clumps to make a tip. Advanced skills are required to both ensure balanced spacing between the hairs and to also achieve an elegant brush-tip shape. 4- Nerimaze 練りまぜ is a process carried out to achieve an evenly distributed mix of differing strand lengths, and it makes a major contribution to determining the final quality of the brush tip. 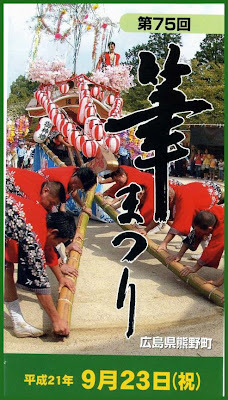 5- Shintate 芯立て is the formation of the final brush-tip shape using a ring-shaped implement. The craftsman feels the tip by hand to check its firmness and resilience, etc. The volume of hair used in the brush tip may be adjusted accordingly in response to how the tip feels. -- Brush Tip - goat hair, horse hair, pig hair, raccoon dog hair, weasel hair, cat hair, and other varieties. Concerning the "calligraphy brush," one of the "Four Treasures of Study" within the Chinese classical canon, in the Nihon Shoki (The Chronicles of Japan) it is recorded that in March of the 18th year of the reign of the Empress Suiko (610); "the methods of making paper and ink were brought about" by the Buddhist priest Damjing. This reference indicates that Damjing was a pioneer figure with respect to the arrival in Japan of writing implements in the form of calligraphy brushes, ink and ink stones. Since then, there have been numerous advances and improvements made in production technologies as calligraphy brushes (and the written word that accompanied them) became key implements in Japan's cultural and traditional development, with many different types of brush produced for different purposes. Around the middle of the Edo Period, along with the rise to prominence of the commercial class, Edo witnessed a dramatic increase in the number of "temple schools". In that the general population also began to write, calligraphy brushes came to be widely used among the masses. Furthermore, a number of classic Edo Fude (handmade calligraphy brushes) were born around this time as production technologies employed by craftsmen developed even further. The dominant production method in Edo was called nerimazeho 練りまぜ法 (literally "the mixing method"), and its processes were established by Hosoi Kotaku (1658-1736) in the Genroku Era (1688-1704). This method of manufacture went on to spread quickly due to the new national education system that was promulgated in the fifth year of the Meiji Era (1872). Due to the combined calamities of the Great Kanto Earthquake (1923) and the Pacific War (1941-1945) many calligraphy brush craftsmen left Tokyo. 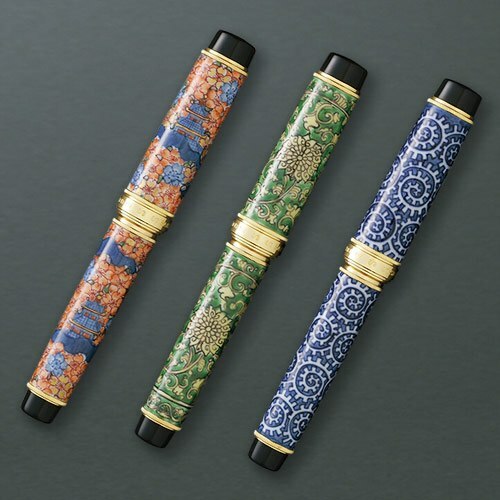 However, those who were left focused both on the production of high-end calligraphy brushes, and on working to keep the relevant technologies and techniques alive. Goat hair, horse hair, pig hair, raccoon dog hair, weasel hair and cat hair are but some of the materials used to make the tips of calligraphy brushes. In many cases the hair of goats native to China is used, with the hair grown below the nape of the neck in the vicinity of the upper forequarters being considered the best quality and thus highly prized. When making a calligraphy brush, in forming the tip which is said to represent the most important part, a metal comb is used to comb through the hair strands and align them accordingly, with strands without proper tips as well as those that are incorrectly oriented being removed. Shaping is the process of forming the brush tip, and advanced skills are required to ensure balanced spacing between the hairs and to also achieve an elegant shape. Nerimaze is the process of taking strands of different lengths and mixing them evenly. This process plays a major role in determining the final quality of the brush tip. Shintate is formation of the final shape of the tip using a ring-shaped implement. The craftsman feels the tip by hand to check its firmness and resilience, etc. The volume of hair used in the brush tip may be adjusted accordingly in response to how the tip feels. Tokyo Teue Brush 東京手植ブラシ Handmade Brushes, "western brushes"
The base wood is cut and planed down. A template is placed over the wooden base of the brush and the bristle insertion positions are marked out using ink. Bristle holes are made at the points marked in ink on the base wood. The bristles are cut to a specific length. Bristles are mixed by hand so that the (soft) tips and (hard) roots are aligned identically. Short bristles, bristles with irregular shapes and other problematic strands are removed. Predetermined clump quantities of bristles are picked out precisely and folded in two, and a metal wire is passed through and drawn along the center of the wood to pull the bristles firmly down into the bristle holes. A thin, wooden cover piece is attached to hide the metal wires and make the product easier to use. ① The size of the main body and attached cover are made uniform and the physical feel of the product when held is improved. ② Grooves are added to the side portions to make the product easier to hold. The bristle tips are trimmed to achieve a uniform, predetermined bristle length throughout. The product's surfaces are painted uniformly. - Bristles: 刈萱 Karukaya, Palm, Cedar, Tampico, fern, horse hair, pig hair, goat hair. Brush production (of so-called "western brushes") commenced in Japan around the 7th year of the Meiji Era (1874). At the time, brushes made in France were used as product examples. In the 10th year of the Meiji Era (1877), the First National Industrial Exhibition was held at Ueno Park, with a display of western-style brushes being very well-received. Following on, craftsmen who had traditionally made Japanese brushes began to get involved in the manufacture of western brushes. Production started off with horse hair being used for bristles, oak being used for timber, and bristle holes being made using hand gimlets. In Meiji 21 (1888), Japan's first brush manufacturing company was established by Matsumoto Jutaro (1844-1914), who was at the time a director of the Dai Hyakusanju Bank (the National 130th Bank). Due to numerous improvements, what resulted was a penetration of brushes into society in much the same way as can be witnessed today. The brush manufacturing industry developed focusing on Tokyo and Osaka. As new machinery was introduced to industries, it came to pass that there were a great variety of brushes used for industrial purposes in workplaces. Moreover, as Japanese home life became increasingly westernized, demand for household brushes increased. Accordingly, in locations such as Wakayama Prefecture, brush manufacturing companies introduced large-capacity machinery and mass production commenced. Later on, in factories in Osaka and Wakayama, even greater industrialization steps were taken. In Tokyo by contrast, a city that had started out with many businesses engaged in producing industrial-purpose brushes, highly-durable brushes whose bristles were hand-inserted were developed. Because hand-inserted bristles in such brushes run together in that they are all pulled down by an internal metal wire called a "pulling string," they are more robust than bristles in machine-made brushes because with machine-made brushes bristles are directly inserted into each individual hole (and they are not secured by a "pulling string"). It is for this reason that Tokyo's brush manufacturers continue the traditional practice of inserting brush bristles by hand.
. shokunin - Edo craftsmen　江戸の職人 . This one is big enough for grown-ups, it is 100 cm wide and comes with a long rope. These small bags are filled with fragrant wood chips, clover chips or dried flowers or other fragrant items. You can put them in the sleve of a kimono to smell well or in your handbag. They are made from colorful brocade and come with a string to hang them. Many traditional housewifes use three of them in each box with their kimonos, as preservatives to keep off the insects. When you wear a traditional Kimono, you usually do not use Western perfume, but the smell from the sachet is enough to make the kimono smell. You can also wear one more in the sleeve or hang it from the belt. In Kyoto there is a special traditional shop 石黒香舗 Ishiguro Koohoo selling only these bags. You can choose your own pattern and the owner will fill it with a choice of your favorite fragrance. Usually 10 different ingredients are mixed in one sachet. If you hang a bag on your handy, you can smell while you talk.
. . . CLICK here for Photos 石黒香舗 in 京都!
. . . CLICK here for Photos of Matsuei-Do in Kyoto! kakekoo 掛香 かけこう "hanging fragrance"
In summer, fragrance satchets are hang on the walls to ward off evil influence and bad smell. 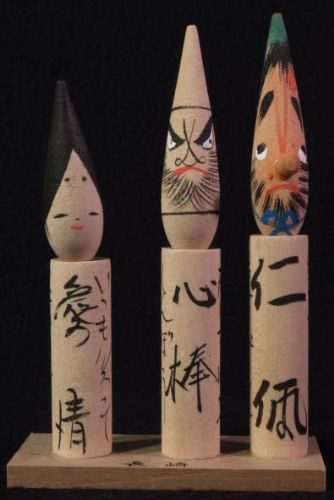 ..... hyakubo koo 百歩香（ひゃっぽこう）"100 steps incense"
kokuhoo (kuroboo) 黒方（こくほう） "black incense"
. WKD - Masaoka Shiki 正岡子規 .
. . . CLICK here for more SACHET Photos ! A piece of cotton cloth to wrap things, one of the most practical inventions. They come in many shapes and decorations and are always a welcome present. 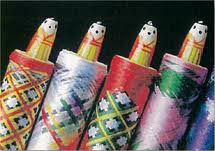 are a type of traditional Japanese wrapping cloth that were frequently used to transport clothes, gifts, or other goods. Although possibly dating back as far as the Nara period, the name, meaning "bath spread", derives from the Edo period practice of using them to bundle clothes while at the sentō (public baths;public furo). 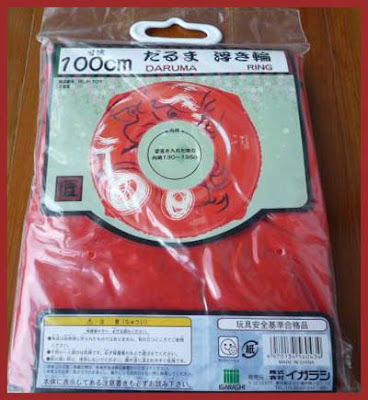 Before becoming associated with public baths, furoshiki was known as hirazutsumi (平包), or flat folded bundle. Eventually, the furoshiki's usage extended to serve as a means for merchants to transport their wares or to protect and decorate a gift. Modern furoshiki can be made of a variety of cloths, including silk, chirimen, cotton, rayon, and nylon. 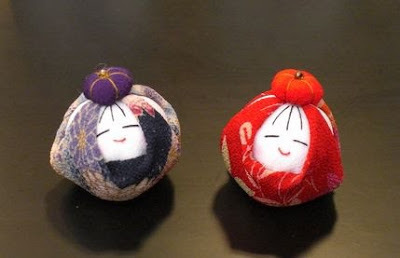 Furoshiki are often decorated with traditional designs or by shibori. There is no one set size for furoshiki, they can range from hand sized to larger than bed-sheets. The most common sizes are 45cm (17.7 inch) and 68-72cm (26.7-28.3 inch). 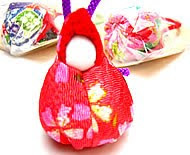 Although there are still furoshiki users in Japan, their numbers declined in the post-war period, in large part due to the proliferation of the plastic shopping bag. In recent years, it has seen a renewed interest as environmental protection became a concern. Furoshiki are, however, commonly used to wrap and transport lunch boxes (bento) and often double as a table mat for the lunch. 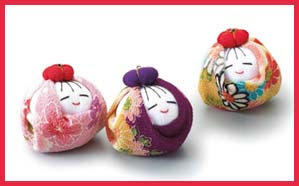 On March 6, 2006, the Japanese Minister of the Environment, Yuriko Koike, created a furoshiki cloth to promote its use in the modern world.
. karakusa 唐草　/ からくさ　Karakusa art motives . 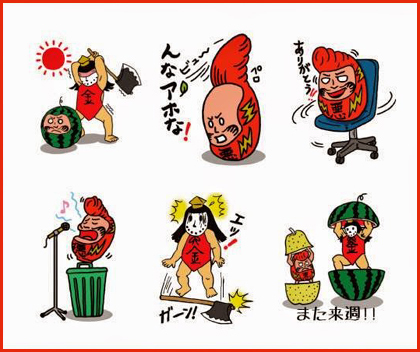 Click for many more bautiful souvenir furoshiki! lit. "mouth of a toad"
共に時を刻む Get old with it together!
. Purses from 畳の縁 tatami heri border brocade . 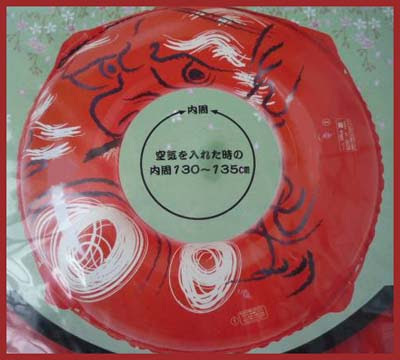 CLICK for more samples with Ukiyo-E prints !
. Ukiyo-E and Edo Culture .
. fukusa 袱紗 small crape wrapper cloth .